Home BOX OFFICE ENRIQUE GIL JUST THE WAY YOU ARE LIZA SOBERANO MOVIES SLIDER 'Just The Way You Are' Movie Box-Office: 12-million on opening day! 'Just The Way You Are' Movie Box-Office: 12-million on opening day! 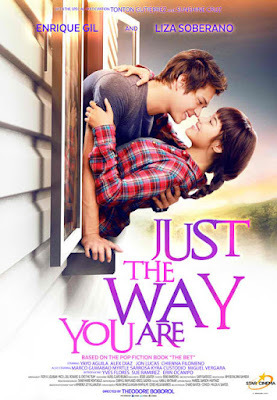 'Just The Way You Are', the launching movie of Liza Soberano and Enrique Gil, had a successful opening in the Philippine box-office today, June 17, 2015. Despite the very competitive movie lineup in Philippine cinemas (such as 'Jurassic World', 'Insidious Chapter 3', 'San Andreas' etc) and heavy rains affecting many areas, the LizQuen film 'Just The Way You Are' under Star Cinema managed to earn P12-million for its 1st day, figures revealed during Liza Soberano and Enrique Gil's guesting earlier on 'Aquino & Abunda Tonight'. That's quite an impressive opening gross earnings for a Star Cinema movie starring the breakthrough loveteam, which started from nothing in the soap 'Forevermore' and is now among the hottest tandems we have. Just like the loveteams of John Lloyd-Bea, KimXi and KathNiel, LizQuen is another example of a loveteam which made a successful transition into a box-office movie, after headlining a hit teleserye. Not all love teams in the country can be successful in both.